There's a new Kings Co Imperial in town—it's the second outpost of the beloved Williamsburg (American-) Chinese spot, and it'll be ready for you to eat meals inside of it as soon as this very Monday. 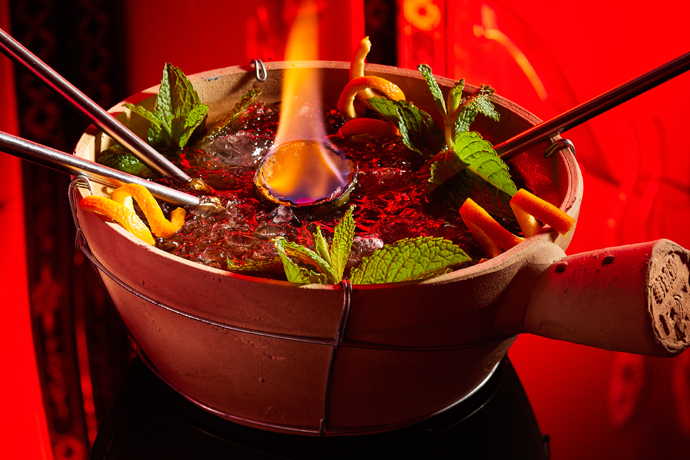 So, if you've been to the original location, you know the drill here: wok-seared dumplings, rum cocktails in tiki vessels and a space that feels properly rustic: all dark wood, brass accents and wood-framed light boxes. Have a look around. You'll find this outpost quite literally tucked under the Williamsburg Bridge. And when you do, make sure you're with a group. The vibe here is low-key and casual, and you want to make use of the curved red leather booths that'll fit you and four other people who also heard good things about the salt-steamed veal ribs (...probably from you.) There is some notable newness happening here: crispy whole Mandarin fish with spicy Sichuan sauce, hand-rolled baby bok choy and chicken coated in house-made sesame sauce and sprinkled with scallions and Pu Pu Platters for shareable barbecue, to name a few. Now, if you take one thing away from this, make it that you can come here till midnight and order their dim sum special for delivery from 11pm till late late—any time that's a weekend time. And just like that, your late-night eats on the LES improved hundredfold.